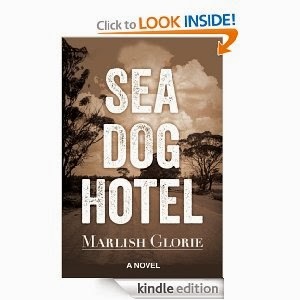 Happiness is counting your blessings while other people are tallying up their misfortunes- or at least that's what you will discover in the electronic pages of local author, Marlish Glorie's, new book. Sea Dog Hotel begins with the classic structure of strangers arriving in town, but Nyacoppin is no ordinary down. Situated in the middle of the West Australian salt lakes, it boasts a population of 80 people. It's biggest business is the Sea Dog Hotel and it is this building that has brought the nomads to town. Grace, who turns 21 on the day the story begins, has become her mother's keeper since the death of her father three years prior, because of her mother's lingering and inexplicable mental illness- a condition that causes her to get the jitters and renders her unable to drive. At first Grace resents being forced to accompany her mother to this nowhere town, but slowly, she learns to love it. So when Ruth decides it's time to move on and search for yet another fresh start, Grace must take action to stop her. Sea Dog Hotel is a distinctly Australian family drama reminiscent of ABC television's Bed of Roses or similar, and I can see it translating extremely well to stage. It has the bleakness of early Tim Winton, with a feminine understanding of love, family, and longing. Most importantly it explore the things that make people happy and the lengths we will go to to find it, always wanting more, more, more. The book is populated by many voices, each with their own yearnings and motivations and at times the multitude of backstories can pull the reader out of the flow as the point of view changes quickly and suddenly, but like a complicated braid, the story comes together artfully, emphasising that the town of Nyacoppin is as much a main character as Grace or Ruth. It is first and foremost a story of personal and emotional growth, of secrets, and of learning new ways to be with one another in a strange and sometimes unforgiving world. Glorie's writing has a simplicity which makes it endearing and which cuts to the heart of the matter. It is easy to identify with the sentiment she is building, as she provides you so many points of view to get on board with. I only wish that this book were available in a traditional format (and if there are any publishers reading this, hint hint) as I am still not a convert to the electronic movement, and reading on a tiny screen does nothing for the immense scope of this book. Sea Dog Hotel is available here.